Mille-feuille is a classic type of French pâtisserie which has seen a recent resurgence in popularity. Literally translated from French as ‘a thousand leaves’, traditional mille-feuilles feature three layers of wafer thin puff pastry, interspersed with lashings of cream and topped with a dusting of icing sugar or fondant. The original mille-feuille recipe is reported to have been first referenced in François Pierre La Varenne’s 1651 cookery book, although Italy and Hungary also claim to have contributed towards its creation. No matter where the original mille-feuille may have stemmed from, today it is most certainly established as an icon in the world of French dessert recipes. In fact, the mille-feuille recipes in this collection wouldn’t look amiss when placed within the window of a high-end French bakery or pâtisserie. 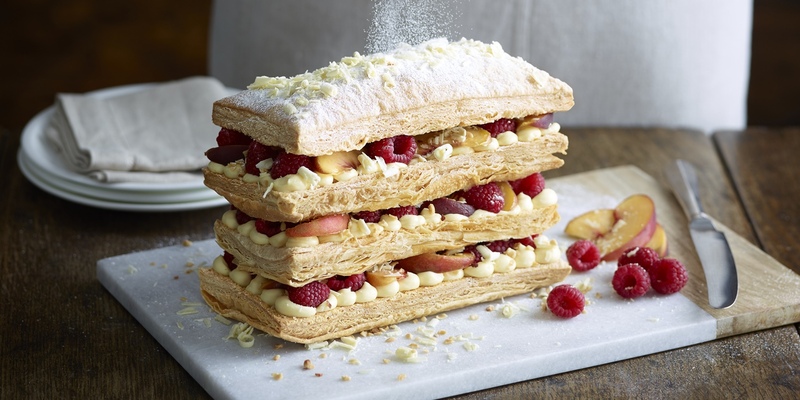 The addition of fresh berries can elevate your traditional mille-feuille to new towering heights as in Sally Abé’s Mille-feuille of peach and raspberry with a citrus cream recipe. Strawberries also make a perfect pairing with mille-feuille, as seen in Adam Byatt’s recipe for Strawberry and macadamia mille-feuille or Stephen Crane’s elegant Strawberry mille-feuille recipe. For a tropical twist, Frances Atkins uses mango and finishes her Caramel mille-feuille recipe with gold leaf to create a decadent dinner party dessert. For tips on how to make the perfect mille-feuille our guide provides the answers as well as inspirational ideas for simple dessert recipes. Mille-feuilles don’t just have to be a showstopping desserts though, they can also make fantastic starters and main courses. Master chocolatier Paul A Young uses savoury chocolate and mushrooms to create his rich Dark chocolate and wild mushroom mille-feuille recipe, the perfect choice for a more unusual dinner party menu.